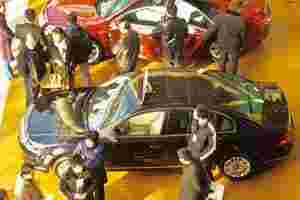 Economy overdrive: Visitors at an auto fair in Jinan, China. The Asian giant is expected to lead recovery of the world economy. Guangzhou (China): For the first time, the Chinese will buy more cars this year than the Americans. Demand is so high that drivers have put their names on long waiting lists for the most popular models. “I’m disappointed, but what can I do?" asked Zhang Ge Lu, a 28-year-old interior designer. He came recently with two friends to a row of dealerships in south-eastern China to buy a black Toyota RAV4, only to be told that he would have to wait two months for delivery. And it is not just cars. For more and more consumer goods, China is surpassing the US as the world’s biggest market—from cars to refrigerators to even desktop computers. The Chinese market is “on full tilt, booming is an understatement these days", said John Bonnell, the director of Asia vehicle forecasting at JD Power and Associates. China is pulling ahead at this particular moment partly because Americans, debt-laden and worried about their jobs, are pulling back. While Americans are saving, the Chinese, whom economists thought were addicted to saving, are spending more. Among China’s 1.3 billion people, rising incomes are finally making large numbers of Chinese prosperous enough to make big-ticket purchases. The question is: Will they keep spending? The Beijing government is increasing consumption with rebates, subsidies and heavy bank lending. Whether China can turn the spending spree into the seeds of a true consumer society matters not just to China, but to the world. For years, the West has pushed China to increase domestic consumption and reduce its dependence on exports—that’s because its overdependence on exports has distorted global trade. To keep its export machine humming, China kept its currency undervalued to make its goods more competitive in foreign markets. The county beggared its own citizens, keeping salaries and bank deposit interest rates artificially low to support exporters. China’s trade surpluses and extensive intervention in currency markets have led it to amass $2.27 trillion (Rs106 trillion) in reserves, mainly in US treasury, mortgage-backed securities and other dollar-denominated investments, helping to keep interest rates low and finance Americans’ borrowing. If the Chinese buy more and Americans save more, a more stable global economic exchange can take shape. That does not mean crises will disappear, but Americans will have to spend less, rather than borrowing so much, and China will be able to buy more of its own goods, building up less lopsided foreign reserves. Meanwhile, China’s rapid consumption growth is good news for the whole world. For the first time, China, not the US, is the locomotive helping to pull the global economy out of recession. But China’s tiny appetite for American exports means that the main benefit has gone to commodity exporters and to businesses in China. While it is spreading creature comforts, China’s lending-based prosperity may also be sowing the seeds of future economic problems. China’s Banking Regulatory Commission recently told banks to show restraint in lending for the rest of the year, fearful that some of this year’s loans could become bad debts in the next several years, as happened with the mortgage lending spree in the US. The size of China’s consumer market, notwithstanding its growth, will make it hard for China to rescue the world economy by itself. Total consumer spending in China is still less than a sixth of American consumer spending at current prices and exchange rates. That is mainly because China has relatively few restaurants, hotels and other service businesses, even as sales of manufactured goods have risen. And though annual incomes still average just $2,775 a person in cities and $840 in rural areas, Western economists predict economy will grow almost 12% in each of the next two years and the renminbi is widely expected to appreciate someday, further increasing consumers’ buying power. Hilda Wang contributed to this story.